As we noted earlier this year, photographer Henry Diltz has taken many iconic photos of Neil Young, as well as, many other legendary musicians over the decades. From Henry Diltz' blog on Morrison Hotel Gallery, here is the story about spending a day at Broken Arrow Ranch with Neil Young and the "Old Man". "Old man look at my life..."
"Neil Young bought a ranch in Northern California which he named "Broken Arrow Ranch". I went up there a few times with Gary Burden in 1971 and stayed a couple days taking pictures. Gary was my art director/ partner and still works with Neil. We used to walk around the ranch in the morning, smoking a fatty and checking things out around the property. The Ranch came with a foreman named Louis Avila who had been there for years. This particular morning we stopped by the foreman's bungalow and he and Neil had a talk on the porch. This was in 1971, a year before his album Harvest came out and as the story goes, this is the "Old Man" that Neil sings about. We later went on to look in a barn where Neil had some guitars. 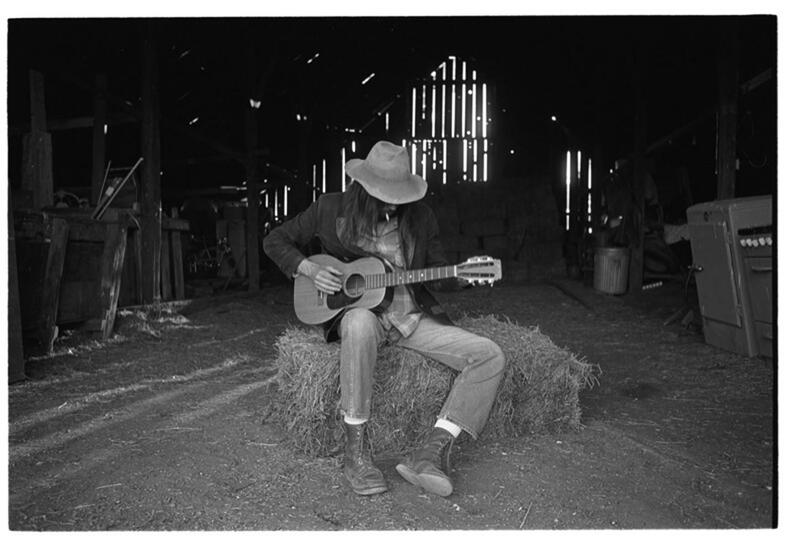 He pulled out a little old Martin guitar, sat on a hay bale, and played a tune. How great it was to be a fly on the wall and document everything that happened. Lots of those pictures got used in Neil Young Songbooks in the 70's." See the photos Henry took the day of this story at Morrison Hotel Gallery.